Recent reports of uranium in monitoring wells near the Sierrita copper mine in southern Arizona have raised concerns from some in the public about potential uranium contamination from proposed new mines in the region. 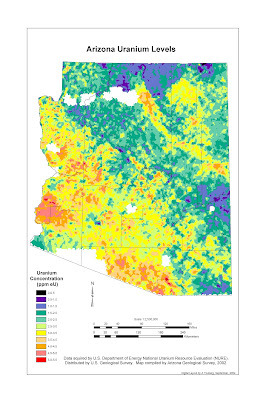 Uranium is a naturally-occurring mineral throughout Arizona, especially in areas underlain by igneous (ie. granitic) rocks, volcanics, and in the north, the Chinle Formation. AZGS released a report in 2002 on "Naturally Occurring Radioactive Materials (NORM) in Arizona" (Open-file Report 02-13, by Jon Spencer) showing the concentrations found across the state. The Arizona House (HB2323) and Senate (SB1338) have now each passed revisions to last year's real estate disclosure bill, including elimination of the erroneous reference to "maps of soils subject to fissures." AZGS supported the change, as soil types are not indicators of fissures and no such maps exist. The new bill also addresses the misperception that homebuyers were required to buy disclosure reports from private vendors under the old law. Testimony from the six invited witnesses at Saturday’s Congressional field hearing on the proposed Rosemont copper mine and the 1872 Mining Law, are posted at http://resourcescommittee.house.gov/hearings/hearingdetail.aspx?NewsID=15. The Committee will only be posting the written testimony of the invited witnesses on their website. Additional testimony may be submitted to the Committee clerk, Holly Wagenet at holly.wagenet@mail.house.gov in Word or Word Perfect format, within 10 business days of the hearing. When I find out how to see the other testimony voluntarily submitted to the hearing, I’ll share that. The Congressional field hearing in Tucson yesterday on the proposed Rosemont copper mine in the Santa Rita Mountains and the 1872 Mining Law, demonstrated two strongly divergent views on mining in Arizona. Arizona is the #1 mining state in the nation for the past two years but now may become a national battleground over the future of mining on public lands. At yesterday’s hearing, Jamie Sturgis from Augusta Resources, the Canadian owner of the Rosemont property, projected total production over the next 20 years at 500 million pounds of copper (roughly 5% of the total U.S. production), 100 million pounds of molybdenum, and 100 million pounds of silver. He expects the mine to pay $1.8 billion in federal taxes and a large amount in state taxes. It will employ 400 with another 700 indirect jobs expected. However, in response to the Rosemont proposal and other proposed mines in the area, Pima County which includes Tucson, wants all public lands to be off limits to mining. In a December 11, 2006 memo to Pima County supervisors, County Administrator Chuck Huckleberry wrote that mineral extraction is “without benefit” to the local economy. In fact, Pima County officials see mining as an overall negative on the economy due to environmental impacts, the concern that if commodity prices drop, miners could be laid off and put on public assistance, and the loss of jobs when the deposit is mined out in the classic style of other boom-bust mining cycles in the West. Other critics of the Rosemont mine argue that new jobs will go to outsiders and the locals will be relegated to “a few truck-driving jobs.” Huckleberry noted that while mining contributed 15% to the county’s economy in 1970, today that value is below 1%. Huckleberry and others made the argument that no mining operation in the county has ever been fully and adequately mitigated, leaving the county and citizens stuck with the consequences, both environmental and economic. He stated that the impacts from the Rosemont mine in all likelihood cannot be mitigated. Pima County sees tourism as a mainstay of its economic and fears that mining will harm its reputation and attractiveness to visitors. Other top public concerns were listed as water quantity and quality, road safety with increased truck traffic, and the visual impacts. Contrast that with nearby Graham County, where 90 miles northwest of Tucson, the new Safford copper mine is being welcomed by the community as an economic savior, according to a recent article in the Arizona Daily Star (2-18-07). Copper production from the mine is expected to start in 2008 from what will be the first major new U.S. copper mine in 30 years, according to the Star. Phelps Dodge is making a $550 million investment in the new mine. Safford officials report sales tax revenues already up 30% last year and 23% in recent months as construction of the copper mine moves forward. Businesses report a doubling of sales and numbers of employees. Mine workers will earn an average $40,000, considerably above the county median income of about $30,000. The Star reported that two years ago the Safford had only one residential building permit issued, while presently there are more than 2,000 residential units being planned or built. There is grumbling about housing costs going up in Stafford as the present mine work force of 600 increases to 1,000 later this year, and about how hard it is to find workers for local businesses when the mine is paying such high wages. Traffic jams are a problem for the first time in Safford. However, even those complaining see greater benefits to the community from the mine. So, these two counties are not just 90 miles apart. They are on opposite sides of a fundamental view of the West. For Graham County, mining is seen as the future. For Pima County, it is seen as the past. For the 12th year in a row, AZGS recently hosted the Arizona Section of the American Institute of Professional Geologists and the AIPG’s national Board of Directors. The program included brief presentations from most of the other geoscience organizations in the state and is becoming a platform to see what is happening across the profession in Arizona and a forum for discussion of partnerships and collaboration among the professional societies. AIPG is also organizing the 3rd International Professional Geology conference for 2008 to be held in Flagstaff and has a strong local organizing committee working with them. Mike Geddis, a Board member of the Arizona Hydrologic Society, noted they have hired an association manager to better handle the 340 members in three chapters (Flagstaff, Phoenix, and Tucson) and two annual symposia. Joe Hart, the newly elected State Mining Inspector, talked about the challenges of trying to close up the 10,000+ abandoned mines in Arizona, 89% of which are vertical. The Legislature seems favorable to adding money to his budget to match with industry money to expedite the process. Joe also is considering using prisoners to help fill and reclaim abandoned mines. Dale Nations, chair of the Arizona Oil and Gas Conservation Commission, said that Arizona produced 55K barrels of oil last year along with 600 million cubic feet (MMCF) of natural gas from 20 wells. Dr. Terry West, a professor of civil and environmental engineering from Purdue, and current national president of the Association of Engineering an Environmental Geology (AEG) tag teamed with Jessica Humble, president of the Phoenix chapter of AEG to talk about the rapid growth of the organization. The Phoenix chapter is only two years old with an active speakers program. Congress is holding a field hearing in Tucson in Saturday, February 24 (details below), on the proposed Rosemont copper mine in the Santa Rita Mountains, south of Tucson. The hearings are coming in apparent response to a letter from Pima County Administrator Chuck Huckleberry, who last month wrote to several members of the Arizona delegation, requesting that all national parks, monuments, and forest lands in the county be withdrawn from mineral exploration and mining activities. Rep. Raul Grijalva from Tucson, is the newly appointed Chair of the House Subcommittee on National Parks, Forests and Public Lands, which is one of two subcommittees that are holding the joint hearing. In addition to the Rosemont mine, the hearing will examine the 1872 General Mining Law. This second theme is gaining national attention with some speculation that this might be the opening round in a renewed effort to overturn the law. A large local audience is expected for the hearing, but the inclusion of the 1872 Mining Law issue promises to bring in mining proponents and critics from around the country. Testimony at the hearing is by invitation only. The House Natural Resources Committee, Subcommittee on National Parks, Forests and Public Lands, and the Subcommittee on Energy and Mineral Resources, will hold a joint oversight field hearing on “Our National Forests at Risk: The 1872 Mining Law and its Impact on the Santa Rita Mountains of Arizona.” This hearing will examine the proposed Rosemont Mine, adjacent to the Santa Rita Mountains of the Coronado National Forest, and the Augusta Resource Corporation’s request for use of public land in conjunction with its proposed mining operation. It will also focus on the suitability of the 1872 General Mining Law for permitting modern hardrock mines and mill sites. Saturday, February 24, 2007, at 10:00 a.m.
Tales of the Tucson Gem and Mineral Show III – Who’s buying the high-end minerals? The prices of high-end minerals are reportedly rising 10% a year or more. What’s driving this? Well, our inside expert who I dub “Deep Mine” says that the stratospheric prices of fine art are driving the wealthy to the relatively cheap minerals markets. Where the top prices for art can easily run into the tens of millions of dollars (and over $100 million for the most sought-ever items), the world’s best mineral specimens command only a fraction of that, perhaps one million dollars. So, you shouldn’t expect the $20 chunk of amethyst sitting on your bookshelf to finance your retirement or the kid’s college tuition. The buyers of the top mineral specimens in many cases did not actually show up in Tucson, instead using expert agents to seek out the best of the best and negotiate the deals. One name circulating widely among sellers is that of Bruce Oreck, heir to the vacuum cleaner business and reportedly a major collector. Minerals are still not widely collected, at least compared to fine art, suggesting that continued appreciation may be expected at least as long as Matisse’s and Rembrandt’s continue to climb. Last Wednesday night as vendors set up their booths in the Tucson Convention Center in preparation of the Tucson Gem and Mineral Show's official opening the next morning, a small crowd gathered with anticipation around the Collector’s Edge display. The company had been operating two booths in other shows for the previous two weeks, so what was different that drew this crowd here among the unpacking going on around them? “Deep Mine,” my guide to the high-rollers in the mineral-collecting world, explained that the owner of Collector’s Edge displays and sells pieces from his own mines, including a gold mine in Mariposa County in California. That night, he brought out five fantastic gold specimens of incredible delicacy, intricacy, and beauty. Within ten minutes of being put on display, according to Deep Mine, all five pieces sold for about $700,000 each. Last night, in celebration of Charles Darwin’s 198th birthday, “Darwin Day” events were held in a couple dozen cities around the county. A screening of the documentary film “Flock of Dodos” brought out an audience of 425 to the Loft Cinema in Tucson. The movie is subtitled, “The evolution-intelligent design circus” and tells principally the story of the fight over teaching science in Kansas public schools and to a lesser extent the similar battle in Dover, PA. The conclusion is that not only are the ID proponents dodos for their flimsy political argument dressed up as pretend science, but that we scientists are also dodos for being incomprehensible, arrogant, and incapable of making a simple case for teaching real science. The movie is funny but devastating to those on both sides of the political controversy. It was exciting for me to watch it because I was there in Kansas for all of the events portrayed and know the participants well. In fact, two weeks after moving to Kansas in 1999 to become State Geologist, based at the University of Kansas, I was testifying to the Kansas State Board of Education, urging them not to adopt the creationist curriculum standards that subsequently brought such ridicule to the state. During the following five years, I was involved with Kansas Citizens for Science, a group formed in response to the creationist efforts to impose a politically driven religious philosophy in science classrooms, and was a outspoken participant in organizing the scientific boycott of the kangaroo-court trial of evolution staged by the ID’ers on behalf of the School Board in 2005. Not coincidentally, the recently elected pro-science Board is scheduled to replace the ID drafted science standards later today and replace them with the well regarded real science standards that were derailed when the ID-controlled Board took control in 2005. Following last night’s screening of the movie, I joined two University of Arizona professors of evolutionary biology on the stage for a panel discussion about what we had just seen. Peter Reinthal is Director of the UA Natural History Museum and a professor in the Department of Ecology and Evolutionary Biology. Joanna Masel, a former Rhodes Scholar, is in the same department and specializes in theoretical or mathematical biologist. The fields she works in tend to involve complex systems whose properties are not immediately obvious from their component parts. This was particularly apropos, as the ID movement is largely based on the premise that some things in nature appear to be so complex that it is impossible to explain them by natural processes. Therefore they can only be explained by the Intelligent Designer (who in most cases, turns out to the personal God of the ID organizers). The work of Joanna and her colleagues demonstrates that the so-called “irreducible complexities” postulated by ID really can be explained by science and don’t need to rely on supernatural forces. The Intelligent Designer, who is invoked mostly to explain the unknowns in science, keeps shrinking away, as a “god of the gaps,” as science explains more and more of the natural world around us. Joanna and Peter did a remarkable job explaining these complex concepts and kept the audience engaged until 10:30 pm when the Loft staff shooed everyone out. The audience members asked penetrating questions and demonstrated a passionate concern about the issues. This may be one of the reasons that ID creationism thus far has not been able to get a toehold in Arizona. The official 53rd annual Tucson Gem and Mineral Show ends today, along with most of the other 49 satellite shows that have been set up around Tucson since late January. You’d be hard pressed to disagree with those who claim it is the largest show in the world. Tucson, a city of 1 million which still embraces a vision of itself as a small town, seemed more like a bustling international street bazaar the past few weeks. There were thousands of vendors here, operating out of tents, hotels, houses, trailers, and warehouses. Gems, minerals, and fossils are on sale from every corner of the world and quite a few from out of this world, including moon rocks and a surprisingly large number and variety of meteoritic materials. The sellers are almost equally diverse. Buyers are estimated at 50,000-60,000 but that seems conservative. It’s not uncommon to see deals for five or six figures being worked out on the floor of a cramped room at the Days Inn, with a box of the “really good stuff” having been brought out from under the bed or other out of sight storage. Among the stories Deep Mine shared over a glass of wine the other night was of being invited to a spacious home in the Tucson Mountains a few miles west of the city. The sprawling “McMansion,” as he termed it, was rented, fully furnished, for a month by representatives of a mineral collection being sold by a prominent East Coast natural history museum. Only 100 potential buyers were invited to the house last Monday evening to view the exclusive collection, valued at $7-8 million. The dealers flew in a chef from France, who is reportedly also a mineral collector himself, to prepare a special meal for the showing to the group. No word yet if the collection sold or what the price was.